According to an article on the UNC Chapel Hill website, bacterial infections can cause the immune system cells to leave the bloodstream and attack the bacteria. When this happens, fluid causes swelling in the area around the infection. When the infection grows unmanageable, the immune response increases and blood pressure drops, leading to an overworked heart, organ failure and sometimes death. Known as septic shock, this syndrome occurs in more than 750,000 people each year. Researchers at the University of North Carolina at Chapel Hill believe that by demonstrating how the immune system chooses between what activities are suspicious and what is a real threat, they could pave the way for new therapies to septic shock. In addition to identifying a new pathway that triggers septic shock, the University of North Carolina at Chapel Hill conducts a number of other groundbreaking studies, due in part to the fact that it is a well-funded market for lab suppliers interested in marketing life science solutions to scientists conducting life science research. In 2012, the NIH awarded the University of North Carolina at Chapel Hill $377.6 million in research funding, while the university also received $38.8 million from the NSF in 2012. Of the NSF research money, $11.5 million went to life science projects alone. For more NIH and NSF funding statistics, including departmental funding breakdowns and specific projects receiving funding, please visit the NIH and NSF websites. 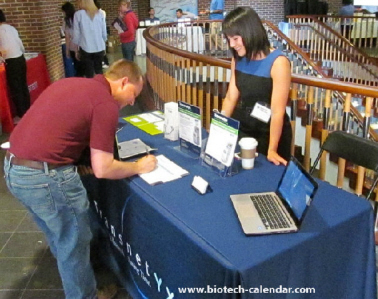 Biotechnology Calendar, Inc. invites all lab suppliers interested in marketing their life science solutions to scientists conducting life science research at North Carolina life science marketing events to attend our annual Chapel Hill BioResearch Product Faire™ Event. Biotechnology Calendar, Inc. is a full-service science research marketing and events-planning company that organizes life science marketing events at top research institutions nationwide. If you are interested in marketing your life science solutions to scientists conducting life science research at life science marketing events closer to home, we encourage you to view our 2013 calendar of events. For more detailed funding statistics on the University of North Carolina at Chapel Hill, or to learn more about the Chapel Hill BioResearch Product Faire™ Event, click on the button below.